Jongmyo is a shrine housing the spirit tablets of the former kings and queens of the Joseon Dynasty. The shrine is a symbolic structure that conveys the legitimacy of the royal family, where the king visited regularly to participate in the ancestral rites to wish for the safety and security of the people and state. Jongmyo is the oldest and most authentic of the Confucian royal ancestral shrines, with a unique spatial layout that has been preserved in its entirety. It was originally built in the late 14th century, but was destroyed during the Japanese invasion during the 16th century, and was rebuilt in the early 17th century with a few expansions made to the buildings thereafter. Jongmyo and its grounds occupy a 19.4 ha oval site. The buildings are set in valleys and surrounded by low hills, with artificial additions built to reinforce the site’s balance of natural elements, in accordance with traditional pungsu principles. The main features of Jongmyo are Jeongjeon (the main shrine), and Yeongnyeongjeon (the Hall of Eternal Peace, an auxiliary shrine). Other features include Mangmyoru, a wooden structure where the king thought about the ancestral kings in memory; Gongmingdang, the shrine to the Goryeo King Gongmin, built by the Joseon King Taejo; Hyangdaecheong, the storage building for ritual utensils; and Jaegung, a main hall with two wings, where the King and participants waited for the rites to take place. Jongmyo was built faithfully abiding by the Confucian ideology of ancestral worship and its ritual formalities under strict royal supervision, and still maintains its original form dating from the Joseon Dynasty. Traditions of ancestral worship rites – Jongmyo Jerye, are still carried out, together with the accompanying ritual music and dance performance. Construction and management of Jongmyo, and the operations of Jongmyo Jerye rituals are all meticulously recorded in the royal protocols of the Joseon Dynasty. 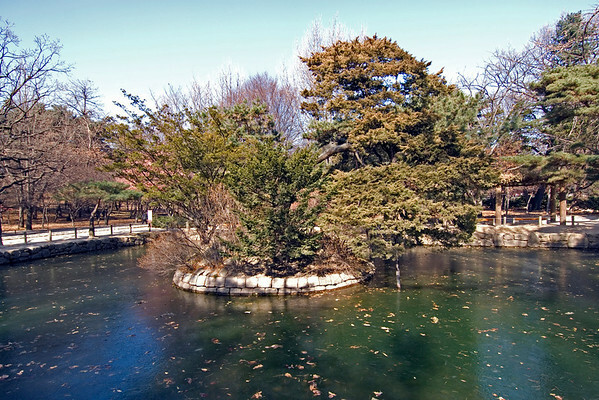 The Jongmyo Shrine grounds is literally across the street from the Changdeok Palace compound. 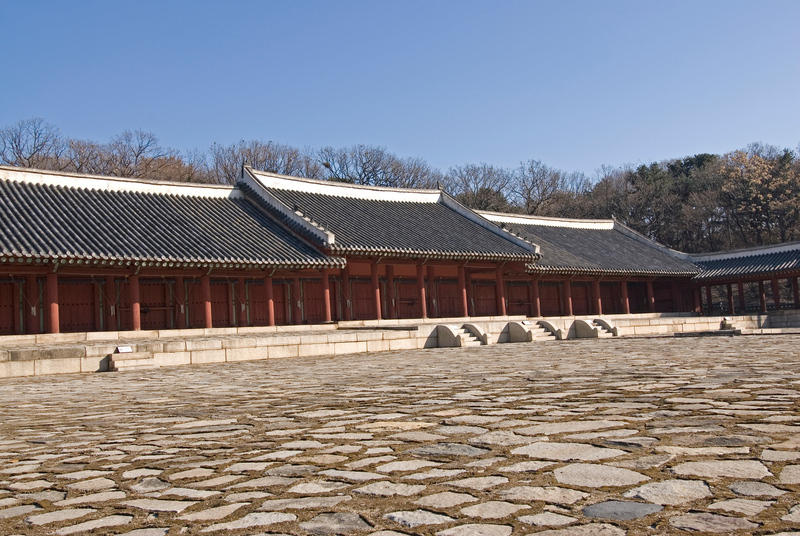 Like the Changdeok Palace, it suffers from a lack of fixtures and artifacts. Unlike the Changdeok Palace, you can enter the grounds with a ticket and stroll around the facilities to your heart’s content. The Jongmyo Shrine is the oldest and most authentic royal shrine from the Confucian period. It is also the best preserved of these shrines. It was built in dedication to the forefathers of the Joseon dynasty that ruled South Korea from the 14th to early 20th century. The current form of the shrine has been the same since the 16th century. 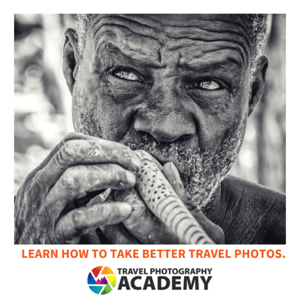 In addition, many rituals and ceremonies are still performed at the shrine, which continues the tradition that was set during the 14th century. There were many other shrines that were built during the Three Kingdoms of Korea period but none of them had survived. The entire ground covered by the Jongmyo Shrine and its surrounding structures cover up to 19 hectares of land area. There are two main components to the shrine: 1) Jeongjeon or the main shrine and 2) Yeongnyeongjeon or the Hall of Eternal peace, which is an auxiliary shrine. There is also a wooden structure called Mangmyoru, wherein the king thought about the ancestral kings. 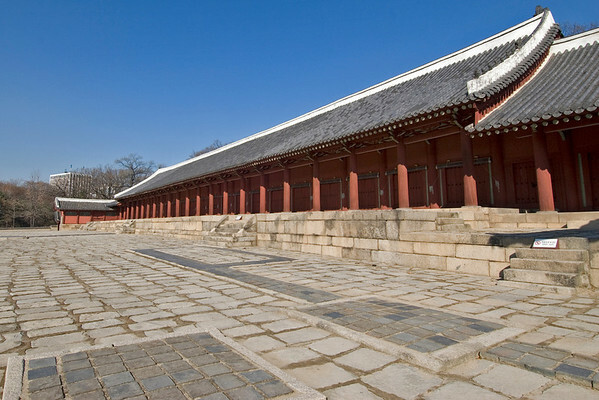 Other components include the shrine to the Goryeo King Gongmin (Gongmingdang), storage building for the ritual utensils (Hyangdaecheong), and main hall with two wings (Jaegung). The Jongmyo Shrine, aside from serving as a memorial to the kings and queens of the Joseon dynasty, was built as a place of worship. It was included to the list of cultural sites by UNESCO for South Korea in 1995, citing the memorial as a place for preserving ancient customs and traditions. The ceremony that was held in the shrine was stopped during the Japanese colonial period in South Korea. However, it is re-lived today through the form of re-enactments of the rituals and ceremonial services in honor of the kings and queens. The re-enactment is performed during the first Sunday of May. The musical part of the ceremony involves instruments and songs that were produced 500 years ago. It is called Jongmyo Jaeryeak. The main building of the Jongmyo Shrine was constructed in 1394 but was destroyed by fire during the Japanese invasion of Korea in the 16th century. It was rebuilt in 1608 and has since been preserved to what it is today. To get to Jongmyo Shrine, you can take the subway train from the Jongno3(sam)-ga station and then use Exit 11. If you are traveling via bus, you can take a number of buses and then get off at Jongno 4(sa)-ga.Jongmyo Shrine Bus Stop. There are no parking facilities in the shrine. However, there are facilities for handicapped visitors or those in a wheelchair. Pets are not allowed inside the shrine premises. View the complete list of UNESCO World Heritage Sites in South Korea.